This article was updated on 5th March 2019. If, after reading, you still have any questions please post them in the comments and I’ll do my best to answer them. Barcelona’s El Prat airport is situated 13km South West of the city and easily accessible by taxi, bus and train (see below for more). The airport’s two terminals, T1 and T2, serve over 40 million air passengers a year, and – unlike at many major city airports – getting past security, passport control and customs is relatively brief and painless… so you’ll be on the beach in no time! As you might expect from any modern aeronautical facility, Barcelona airport has ATMs, bureaux de change, left luggage/security lockers, and plenty of restaurants and shops to while away any waiting times. You can also access free WiFi, more information on the official website. …and back again. We look at all the options, starting with private transport, then moving on to public transportation. There are a number of companies who will offer to take the minor stress of getting from El Prat to either your hotel or apartment or other destination, such as the cruise port, by organising your airport transfer for you. Not always as cheap as navigating your own way there, many travellers prefer the peace of mind of having an English-speaking driver meet them at arrivals to make sure nothing goes wrong on the day. For families and larger groups taking a taxi can work out as not much more than buying several Aerobus tickets for example. 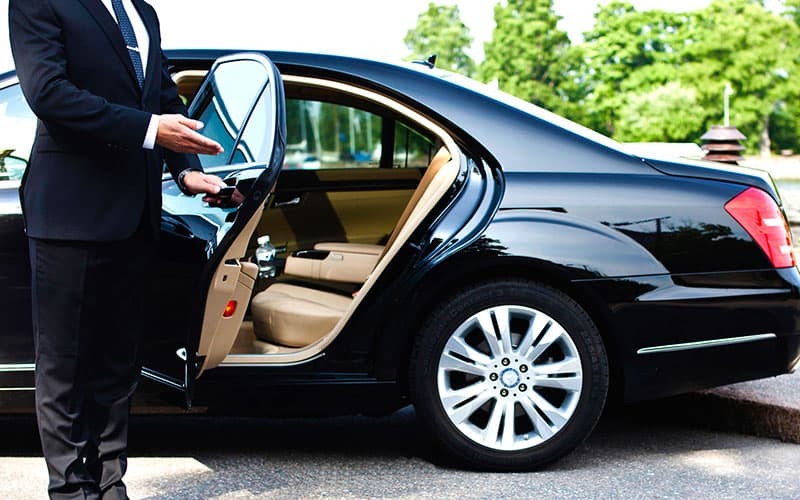 Is a Private Taxi Transfer right for you? Pros: Convenience, peace of mind, comfort. Fastest A-B option. Cons: More expensive than public transport (especially if you’re travelling solo). Best for when…. you want door to door service, and don’t want to mess about. Cheaper between more people. Reservations: Check the companies listed below. When you book via Welcome you get your own private taxi for the same price as from the line, but with the added bonus of an English-speaking driver, a flat fee (so you know in advance what you’re paying), 24/7 customer support, flight monitoring in case of delays and free cancellation if there’s a change of plan on your side. This reliable local-based travel agent and tours specialist offers several different types of transfers, catering for different needs. Their private transfers are perfect for groups of ALL sizes, since you can select anything from a 4 passenger sedan (€48 flat fee) to a 55 seater bus (€198 flat fee), with also very handy 6, 7 and 13 seater options, all reasonably priced. Families, corporate groups and sports teams do check them out! They also offer a shuttle bus service, which is a kind of taxi share system, where a minivan picks up you (and others) and shuttles everyone to their respective hotels. Obviously it’s not quite as speedy or comfortable as your own taxi, but at just 13 euros per person it’s great for solo travellers, or couples on a budget. Finally BCN.travel also offer shuttle bus services up to the Costa Brava (Calella, Pineda, Santa Susanna, Malgrat, Blanes, Lloret and Tossa de mar), and down to the Costa Dorada (Salou, Cambrils, La Pineda, Port Aventura). Click the link for all your options. Grabbing a cab from the rank is the lazy (wo)man’s method of transport from El Prat to Barcelona city centre, as no reservation is required. The cons are that you may have to queue, and you won’t know which company is running the vehicle, so there’s a bit less accountability than with the above companies (who will be keen to keep their Google / Facebook / Tripadvisor ratings high!). But price-wise it should be about the same, around 35-50 euros, depending where in the city exactly you’re going. Everything should be done on the meter so you’re unlikely to be ripped off, although knowing a bit of Spanish will help avoid any miscommunication. Journey time 20-35 mins. 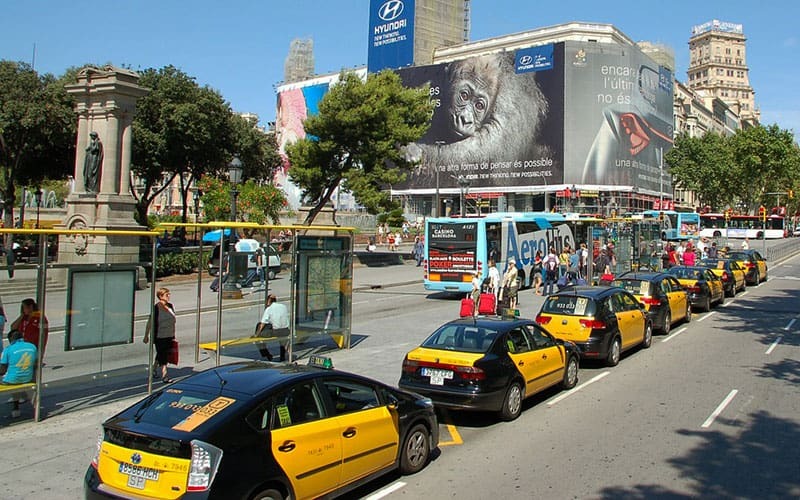 An express bus service called the Aerobus runs from Plaça Catalunya to Barcelona airport and vice versa at regular intervals – every 5 to 10 minutes – and is definitely a cheaper alternative to a taxi, especially if you’re flying solo. It runs from 5.30am to 1am seven days a week, 365 days a year. 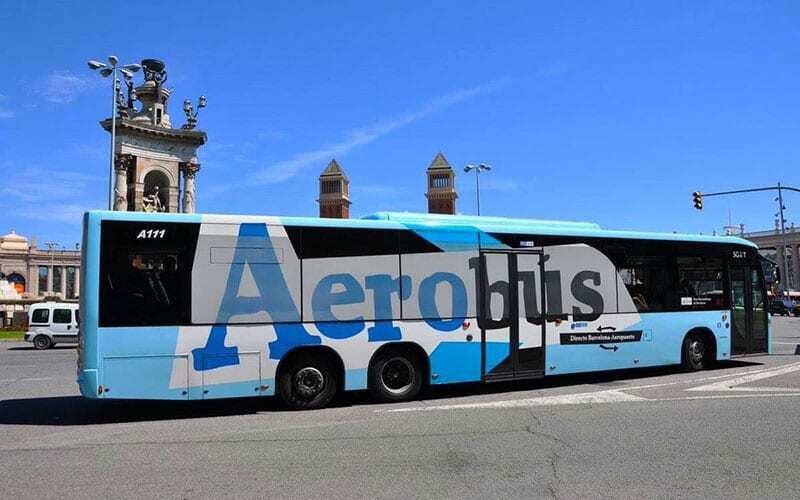 The Aerobus 1 (A1) takes you to Terminal 1 and, you guessed it, the A2 takes you to Terminal 2. Tickets currently cost €5.9 for a single and €10.20 for a return. It’s a good idea to buy them in advance as then you won’t have to queue to buy a ticket (enabling you to board quicker), or get stuck with the wrong change: you can buy tickets online via the official website. Head to our full article for more info on the bus route, stops and schedule. Is the Aerobus the right option for you? Best for when…. you don’t want to pay for a taxi. Especially if you’re a solo traveller or young couple. Best public transport option. Aside from the Aerobus, if you could also catch the number 46 public bus, which goes from Parallel past Plaça Espanya and then on to both terminals T1 and T2. A nice and cheap option, a ticket should just cost you a couple of euros, however do bear in mind that being a normal bus it does make quite a few stop offs en route, and waiting time between buses may be longer than the Aerobus (usually between 10 and 15 minutes). It runs from 4:50am to 11:50pm every day. Route and timetable here. Is the 46 bus the right option for you? Cons: Only really convenient if you’re staying in Paral-lel or Plaça Espanya. Slower than the Aerobus. Best for when…. you’re determined to save every penny! Since 2017 it’s been possible to get into the city centre via metro. The L9 (orange line) runs around every 7 minutes and stops off at both terminals before carrying passengers to the edge of town, where you can switch onto the red, blue or green lines at Torrassa (L1 – red line), Collblanc (L5 – blue line) or Zona Universitària (L3 – green line) and continue your journey. It’s not the quickest to be honest, especially when compared to the zippy Aerobus, however depending on where your hotel is it might be a convenient option. You need to buy the appropriate ticket which costs €4.6, one way to any station on the metro network. (NB: you cannot use your T10 metro ticket). Is the Metro the right option for you? Best for when…. you’re travelling to the south side of the city, or to a trade fair at Fira. You can board a train to the city centre from ‘Aeropuerto’ train station just five minutes walk from T2, aka Terminal 2. They are not as regular as the buses (approx. every 30 mins) or as convenient for luggage, and if you land at Terminal 1 you’d have to take a bus to Terminal 2 first (ie. only consider this option if you flying in or out of T2), but on the plus side a ticket is just over 3 euros and journey time only 18 mins. The train calls at central stations Sants, Passeig de Gracia and Clot and you can check the timetable here. Similarly you can do the same journey in reverse to arrive at El Prat. Nota bene: you can change onto the metro at any of these stations. Is the Train the right option for you? Cons: Only goes to Terminal 2. Only runs every 30 minutes. Best for when…. when you’re flying in or out of T2, and staying near one of the train stations on the line, like Passeig de Gracia or Sants. The N17 runs from Terminal 1 to Plaça Catalunya between 9:55pm and 4:45am, costs a couple of euros and is surprisingly quick (not much traffic at these times!). It runs every 20 minutes – and speaking as someone who regularly had to spend an entire hour waiting in the freezing London cold for the N3 home from Trafalgar Square to Beckenham, that seems pretty good to me! On the way back you can catch it between 11pm and 5am, although do note the bus stop isn’t on Plaça Catalunya itself. There are stops at Ronda Universitat and Placa Universitat. More info here. Is the N17 Nightbus the right option for you? Cons: Only goes to Terminal 1 (not 2), electrifying possibility of random drunks on board. Best for when…. you’re poor, travelling solo, and you’ve accidentally booked a flight that arrives / leaves at a hugely inconvenient hour. Should you ever find yourself at the wrong terminal at Barcelona airport fear not – free and regular shuttle buses will ferry you on your way to your flight. They stop outside the main entrances, just keep an out for the green and blue buses that say T1 – T2 at the front. You can find left-luggage storage in both Terminals 1 and 2. In T1 the office is located in the “intermodal lobby” on floor P0, on the lowest level of the Plaza and is open 24 hours a day. Find the office at T2 in the check-in lobby. It is open from 6.00am to 10pm. Normal luggage (suitcases or similar): €6 per item for first two hours; €10 per item for every further 24 hours. Special luggage (surfboard, bicycle, etc. ): €9 per item for first two hours; €15 per item for every further 24 hours. For more details, or to check these prices are up to date, head here. Need more info? Needless to say we’ve got some wise advice on booking flights to Barcelona for you to check out which could save you a bob or two. Meanwhile if you’re flying into Reus, then head to our guide on getting from Reus Airport to Barcelona. Similarly if you’re flying to Girona, then we have an article on getting from Girona airport to Barcelona too! If there is any information missing on this page, please comment below and we’ll endeavour to answer all your questions! Click onto our listing in our Services section to see the exact location of El Prat Airport on a map.